Anglers often catch pompano in the surf on beaches. 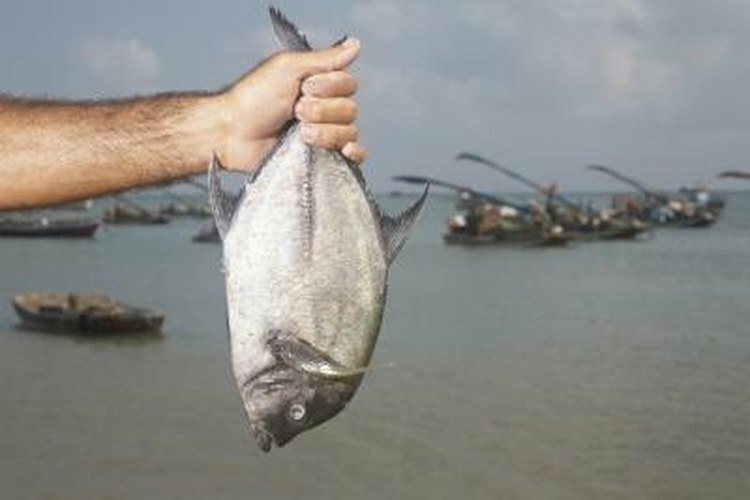 Prized for their delicious meat and tenacity, pompano are bottom feeders that average between 1 and 2 lbs. Anglers most often target this popular sport fish from a beach. Pompano are schooling fish. Where there is one, you will find many more. To catch a pompano, outfit your rod with light tackle and smaller hooks. Great baits for pompano include live sea fleas, fiddler crabs and small blue crab. The best time to fish for pompano is during the last two hours of a rising tide or the first hour of a falling tide. Cut a 2-foot section of 50-lb. test line. Tie a black swivel to both ends. Secure the 1/2-oz. egg sinker to the end of one swivel. This is your main line. Cut two 1-foot pieces of 10-lb. test line. These are you trace lines. Secure a 6/0 size hook to one end of one of the trace lines. Place an orange bead on the line above the hook. The orange bead simulates the look of a female sea flea with an egg sack. Repeat this process for the other trace line. Secure the trace lines to the main line. Place one trace line 6 to 8 inches above the sinker. Place the other 6 to 8 inches above the first trace line. Tie the trace line to the main line so that 4 to 6 inches of trace line hangs loose from the main line. Sea fleas are one of the most effective baits to use for pompano. Try finding live sea fleas on the shoreline buried in the sand.